Modules are suitable for everyone, but for us, every customer is important and we carefully pay attention to his requirements. Be always ready to start new adventures in betting. All modules are very powerful and easily customizable. 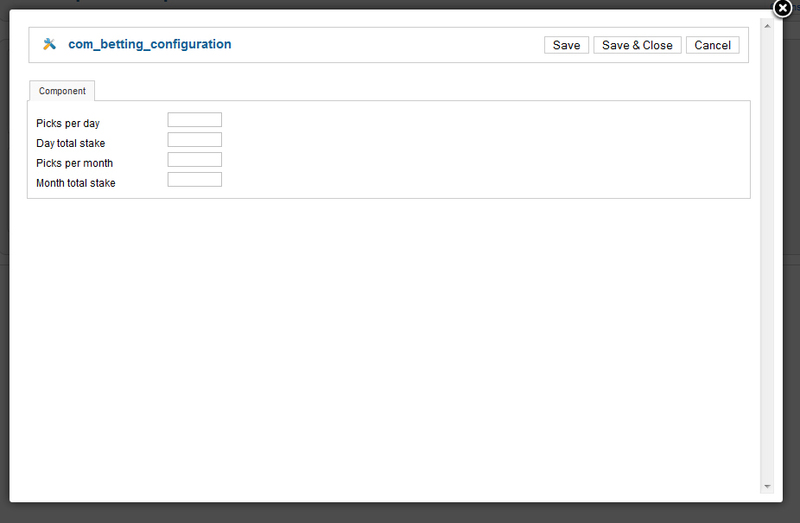 Our modules are very flexible and you can easily modify settings. If you need custom changes, contact us for more informations. Our team takes special care to support you. You can expect our support within 24 hours. We are here also for any other demands. The cheapest solution for you. 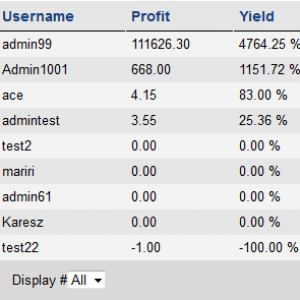 We can afford such a low prices, because our modules have been developed for wide public. You can use multilanguage in all of our modules. You can easily translate modules to your language. Tipster script is an amazing extension for all who wants to start own tipster bussiness. With this extension you can easily control previews, results, users and tipsters. Tipster script is the first script made for public. 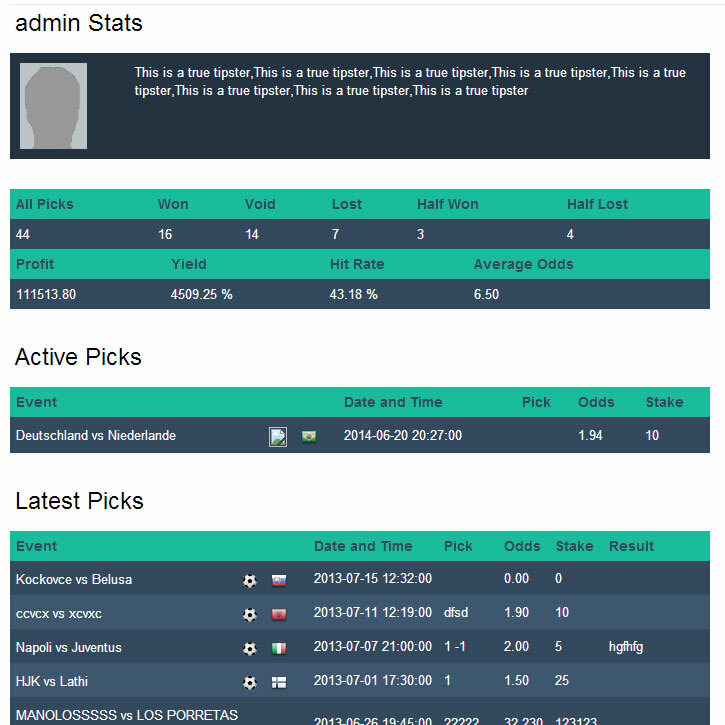 Admin has full control of users, tipsters, picks etc. You can select between dark and white style. If you need something different than you can add your own style. More detailed description is in documentation. If you know css and it is nothing hard to style by your needs, otherwise you can always contact for help. In last update we added new responsive design. 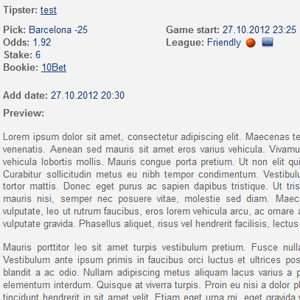 Check it with your tablets and mobiles on: http://demo.betting-scripts.com/tipster. Admin can add picks on beckend. He can also choose user to whom will be pick posted. 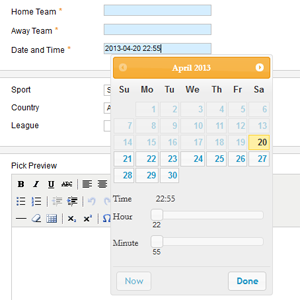 Admin also can control users, bookmarkers, sports, countries, picks etc. That means admin can check who will be tipster and he can always remove him or just unpublished him. 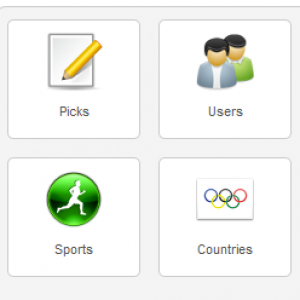 There are predifined sports, countries, bookmarkers, but Admin can delete, edit or add them. Admin has option where he can set day limit for picks and/or stake. He can also limits on monthly basis. 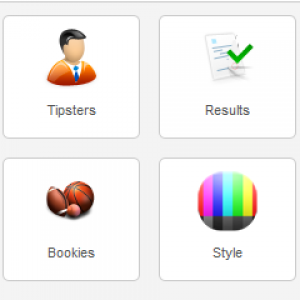 Every tipster has own page, where you can see his stats. There are also active picks and latest picks. Every tipster can download all picks in excel document. Tipsters do not need administrator access. 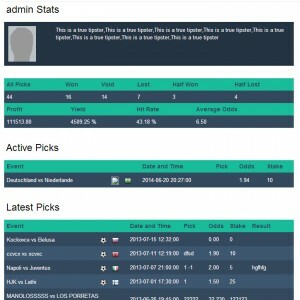 They can add picks from frontend: http://betting-scripts.com/how-to-add-new-pick-on-frontend/. There are 3 different odds type (decimal, fractional and american) and every user can change it in his profile. That means admin could set default odds type for whole page, but every user can possibillity to override with own odds type selection. 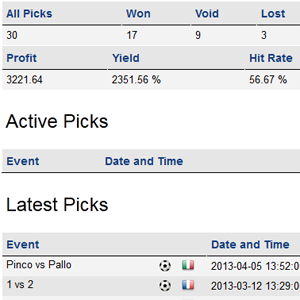 In new update we added tipsters stats with an image on every single pick page. 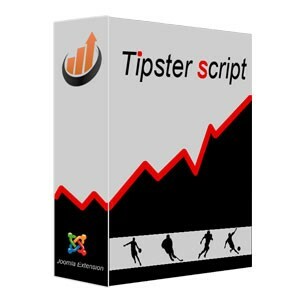 Tipster script is an amazing extensions for all users, who want to start their own tipster bussiness. It is easy for manage, very customizable and well documented. You also don’t need to pay extra for updates, it is lifetime free. There is also many extra extensions, which makes Tipster script even better. 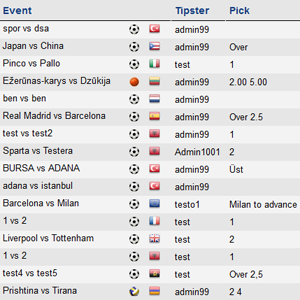 At this moment Tipster script is translated into 7 languages, if your language is missing please contact us over email.